How Are Anxiety And Depression Connected? Anxiety and depression are two debilitating disorders that are often associated as one in the same. Although anxiety and depression may occur at the same time they are very different disorders. Anxiety and depression are connected because many people who are suffering from depression exhibit symptoms that are common with anxiety. Anxiety disorders create so much disruption in a person’s life that they are unable to function normally. Anxiety disorders are considered to be a severe mental illness. There are number of different types of anxiety disorders. These types include panic disorder, obsessive-compulsive disorder, phobias, generalized anxiety disorder, social anxiety disorder, and post-traumatic stress disorder. Although there are a number of different types of anxiety disorders there are common universal symptoms. These symptoms include problems sleeping, palpitations, obsessive thoughts, panic attacks, uneasiness, and a host of other items. The reason a person develops an anxiety disorder is not known. Researchers believe that anxiety disorders may be due to changes in your brain as well as certain environmental stressors. A doctor will perform a variety of methods to diagnose an anxiety disorder. An evaluation that covers your medical history and physical will be performed. Your doctor will also test for physical illnesses that may be the root of your symptoms. Depression, although exhibiting similar symptoms of anxiety disorders, is a different disorder. However, it has been noted that people who suffer from depression experience some form of anxiety disorder. 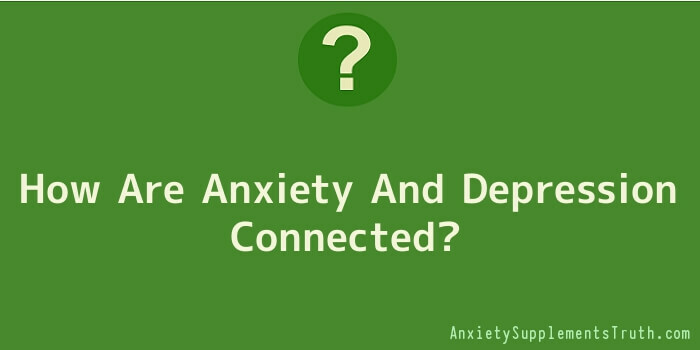 There is no direct link that has been established that provides evidence that anxiety causes depression or vice versa. Depression is characterized by powerful feelings of sadness, worthlessness, helplessness, and hopelessness. These intense feelings prohibit a person from living and functioning as they normally would. These feelings may last for only a few days or even longer such as weeks or months. There are a variety of different types of depression. These types include major depression, dysthymia (chronic depression), bipolar depression, seasonal depression (SAD), psychotic depression, and postpartum depression. As stated above, common symptoms are shared by those who suffer from anxiety and depression disorders. Some of the symptoms of depression include difficulty sleeping, daily loss of energy, difficulty concentrating, loss of interest in activities, loss of appetite, and suicidal thoughts or attempts. As with an anxiety disorder, your doctor will use a number of methods to determine if you are suffering from depression. Medical history, physical evaluation, as well as evaluating your feelings based on the major symptoms of depression are all used in diagnosing this disorder. Anxiety disorders can be treated in a number of different ways. Medication is one method that can be used to treat anxiety disorders. Psychotherapy is another method that is used to treat anxiety. Counselling and cognitive-behavioural therapy, forms of psychotherapy, can provide tools to help a person deal with the emotional aspects of anxiety. Making changes in your diet and lifestyle can also help to treat anxiety. Depression is treated similarly to anxiety disorders. Medication, psychotherapy, and lifestyle changes are all used to treat depression disorders. In many cases doctors recommend that a combination of each form of treatment be used in combating anxiety and depression disorders. It is important to seek medical and professional help if you believe you are suffering from an anxiety or depression disorder.